There are two org charts in every company: The first is the “official” structure where respect is paid to rank, who reports to whom, and time in the organization (“he’s paid his dues”). It’s the second org chart, however, that determines which leaders we follow. This informal structure is built on one thing: respect. Not the sort that’s increased by the power or the authority one is granted, but an esteem that is earned. The single most effective way to acquire this respect, to climb this org chart, is by bringing more value to the customer and the company. Do this and you are respected. A mentor of mine, Doug, told me: “This is one of the most difficult transitions for any company: growing based on value rather than by power.” Organizations that get these two approaches confused experience a riptide force within their walls that puts operations into a swirl. What’s your plan to earn more respect? 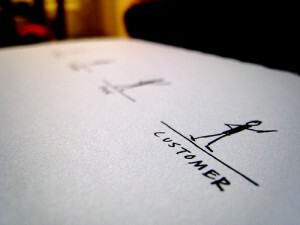 personal integrity to your customer! You should be able to stand up and defend your customer within your organization. You are building TRUST and that pays out in value later on for both: client and customer. Thomas – Thanks for your meaningful comment about defending customers. So true and shows your tremendous leadership. Thanks for the great thoughts! I plan to earn more respect amongst my peers and coworkers by leading by example. I believe that if I take the initiative to promote positive change my coworkers will follow in suit. To me it is all about being on the path and if we are off the path finding positive ways to get back on the path and headed towards the big picture.